UK Poker News continues its extensive and illuminating interview with one of Ireland's new poker talents, Oliver Boyce whose World Speed Poker Open victory in 2005 triggered a sensational run of poker form. In this second part, Oliver talks about how he qualified for the WSOP 2006 Main Event to be held this Summer in Las Vegas, his thoughts on what it will be like, and also discusses some exciting live play he experienced in the card rooms of Dublin. In the third and final part, to be published later, Oliver looks at his online game, how he plays for a profit, and considers his poker goals for the future. Be sure to check back soon to UK Poker News. UKPN: Not content with qualifying and winning the World Speed Poker Open, you have now managed to qualify for the World Series of Poker Main Event in Las Vegas in July! Tell us how you did it and a little about how you handle the closing stages of an important on-line qualifier with so much at stake. OB: I only qualified last weekend, so I'm still walking around with a smile. My next target after the World Speed Poker was to make the main event in Vegas, I thought about buying in, but decided to do my best to win a ticket. A couple of weeks ago, I played a qualifier on Paddy Power and came about 18th. Then I tried to concentrate on the European Open in London this month and I made the final table 2 weeks running and managed to throw away a big chip lead in one of these final tables. So my confidence was a bit low and I had no intention of trying to qualify for the WSOP that night. But I got an Indian take away, sat down with a bottle of wine, which is normally a no-no for me when playing poker and got started. In the first level my starting stack of 2,000 was down to 700, but I managed to get back to 2,000 and then slowly got it up to 7,000. There were 158 runners in the event and from about half way I took a big chip lead when I had about 1/3 of the chips in play. I kept this lead and increased it all the way by being aggressive with position and playing any pocket pair aggressively. This really paid off when we got to the last 6, I had 44 under the gun, raised to 7,200, the player in mid-position went all-in for his remaining 12,000 and I called after thinking about it for ages. He had 33 against my 44. When we got to the final 3, I was 5:1 chip leader on the second placed player and 10:1 on the other, so I just kept putting them all in and eventually we got down to two players. When you get to a final table of a main event, I like to play nice and tight for the first few rounds and play premium hands very aggressively. I'm willing to push with most pairs and AK, etc. I feel that most players fear what they have to lose and I fear not winning it, so it helps me to be more aggressive with my hand selections. I always play the same starting hands as I did at the start of the game. It is important to pick your moment though and not to allow yourself to be trapped, but most final tables are all pre-flop action, so get your money in with the best hand you can, which is mostly pairs and keep the fingers crossed and try to avoid going up against the bigger stacks, as they can knock you out, always attack smaller to medium size stacks. UKPN: Are you planning to use the trip to Las Vegas to play other tournaments or side games or take time out to see more of America? OB: I am travelling over on the Wednesday or Thursday before the main event. Vegas is a hard place to relax in, so I don't want to be waiting around to play, which could be the hardest thing to do. I don't know which day I'll be playing, but I am hoping for the Saturday or Sunday. I've marked the $1,000 and $1,500 events which start on the 3rd and 5th of August if I'm not still involved in the main event. I won't take in any other action, as I want to be fresh for the main event or side events. I'll bring the laptop and keep my game sharp on that. I've been to Vegas three times now, so I'm hoping to bring my family and some close friends. If that happens I'll rent a house and let them travel and see the sights. I've already seen most of the sights and I love going to America so this trip is really about the bracelet for me and that's what I'll spend my time concentrating on. I know my parents will be amazed at the place, so this will be a special trip for them and they've never seen me play poker besides on television, so it's a treat for them for their support over the last 6 months. UKPN: Apart from these one-off specials, you have enjoyed playing other events back home such as the Paddy Power Xmas Cracker and the Poker Events Tournament at the City West Hotel in Dublin. Tell us more about these. OB: The Paddy Power Xmas Cracker was very special, not only did I qualify online again for this, but Paddy Power had arranged a special one-off tournament for the best professionals in Ireland and anyone who wanted to cough up the &euro;500 entry fee. There were over 60 runners and the cream of Irish poker, Andy Black, Frank Callaghan, Liam Flood, Scott Gray and Padraig Parkinson and many Irish sport heroes were present like Ken Doherty. Paddy Power used the event to publish my big win in the WSPO and my photo was on posters all over the place. The highlight was when Ken Doherty congratulated me on my win and how he enjoyed watching it on the television. My QQ got cracked early in a raised pot by 68 suited to knock me out. Poker Events hold events all over Ireland and it's very professionally run with quality fields and excellent structures. In their event in City West last January I had my AA cracked by QQ when a third Q hit the turn. I've had cashes in smaller events around Dublin, but have struggled to find my form in major events, but have always finished in the top 1/3 of the field, but mostly outside the money. UKPN: Roy "The Boy" Brindley has told us that the Dublin poker scene is vibrant. How do you view the Irish poker environment yourself? OB: Poker in Ireland is currently on a high and you can play in 3 to 4 different venues every night and have the option between small and large buy-ins. There is at least one major event held each weekend. Cash games are also very popular along with STT. The standard is very mixed, from very poor, to average to the top players. It's very hard to win events in Ireland due to the size of most fields and the quality involved. On the international arena, Irish players have struggled in recent years except for Andy Black's finish in the WSOP, but there's loads of great players coming through and I'm confident we'll see an EPT winner very soon from Ireland. 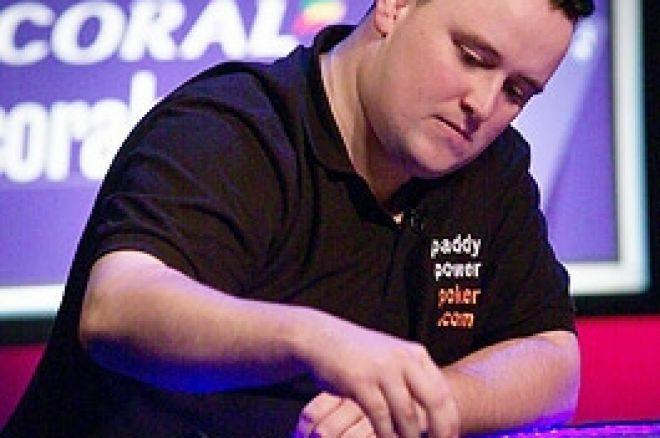 UKPN: Roy Brindley also said some of the best Omaha cash players can be found in the Dublin casinos. Do you play Omaha to any great extent and, if so, what do you think makes a winning Omaha player? OB: Omaha is not really my game, but I've sat at some of the cash games in Dublin and have left the table in profit, but don't really know how. They seem to like to raise and re-raise players out of the pot. I've watched some players bring &euro;30,000 to the table, so it's an active scene in Ireland. I've decided to stay away from it until I learn the proper skills. Ed note: You can qualify for every WSOP event with Bet365Poker and meet Oliver at the tables in Vegas.